Today is December 9, 2017 and Crown Princess Masako celebrates her 54th birthday. (born on December 9, 1963) On the occasion of that birthday, Imperial Household Agency published new photos of Crown Princess Masako. ( Cabinet of Japan, on Friday formally approved April 30, 2019, as the abdication date for Emperor Akihito. 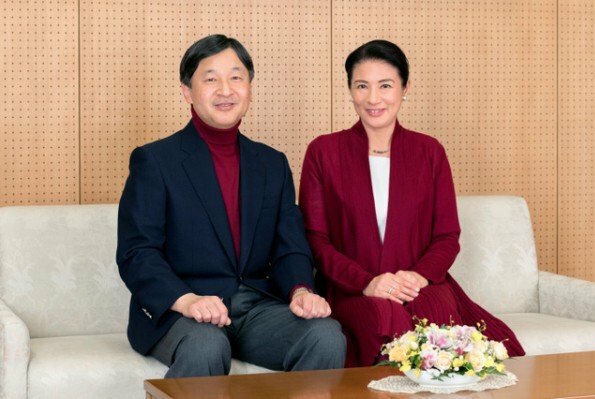 The Emperor’s elder son, Crown Prince Naruhito will accede to the Chrysanthemum Throne the next day, May 1, and Crown Princess Masako will become empress). 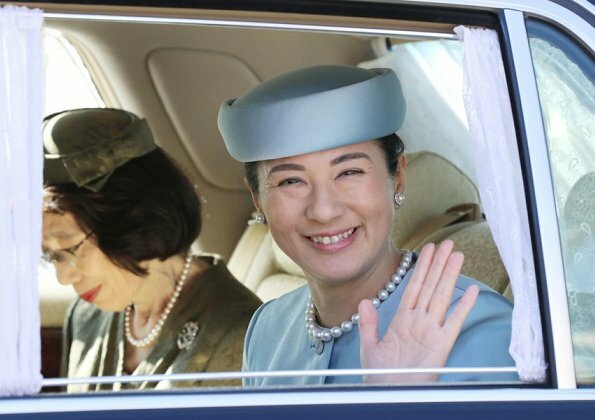 On Dec. 9, 2017, Japanese Crown Princess Masako arrived at the Imperial Palace in Tokyo, her 54th birthday. 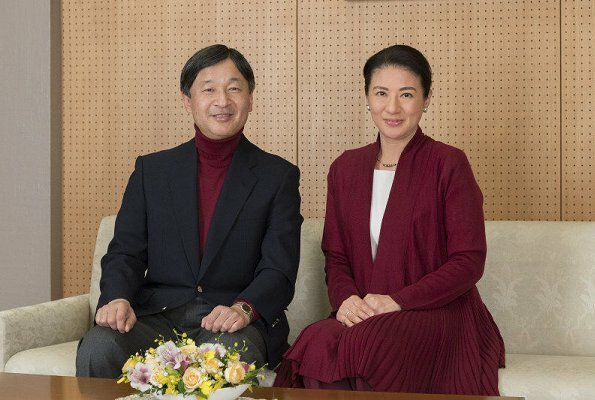 The crown princess vowed to continue efforts to fulfill her duties as she is set to become Japan's empress in May 2019. Wonderful! She looks happy and healthy. And I think that for the first time, C. Prince and Masako have combined the colour of their outfits in flattering burgundy. Muy guapa con el pelo recogido y vestida con un color que le favorece. Lovely lady and she looks well here. It's a shame her position has made her life so difficult for her at times. Commemorative photo at the same room every year. Also, modification / processing of the photo. An announcement of intentional sentences. There is no real voice, too. Strong words. Of course you may live so near her that you know everything about her possibly health status? I do not see any big photoshoping here, what part you think is so much modificated? I would actually like to develop those pics a bit more, all basic settings are not done enough. That is true that they do not have any creativity with these pictures, but is Masako to blame for it I very much doubt. I think she will feel much better as empress and maybe even get Japan a bit to the modern era. I went to see your blog and it make me feel sick. I have never seen more malevolent blog than yours. I only respect those who are sincere in public affairs and Shinto ritual of the Imperial Family. Have you been watching Masako for over 20 years? Please abandon preconception and look objectively. Please learn Japanese and watch blogs related to the Japanese Imperial Family. I overlooked the previous question. Photos have been usually retouched so that she looks slim. You check about Masako, and I am glad if you know the truth. I do not understand exactly all of your words because I am not a native English speaker. If words are strong, I am sorry. Actually my hubby is very big boss in Japanese company here in my country. What makes that we have been in Japan several times and I (and my hubby) have had to learn very much about Japanese culture and country. I can tell straight away your obsession to abuse Japanese Emperor couple and Crown prince couple has nothing to do with common Japanese thinking. Also such writing about any royal family (or anybody else so far) would be more like defamation. In many countries you should be scared of charge really. Nothing you write goes under category "truth". You do not write they may have/be something, you write they are and that is really a slander. Those pictures, Masako has been modified slender only in your dreams. I can tell you a big hidden secret of professional photographers, pictures, they are all kind of modified. Certain things are made proper like white balance, shadows etc. In these pics modification is made LESS than I normally do with my own basic pictures. I do admit I do not live in Japan and never have been there. But I have the impression that your words, Makoto, are exactly those words that put even more pressure on people who suffered from a depression. Calling them "lazy", although it is a very serios disease. She looks lovely and I wish her all the best. I never comment, and it would never occur to me to make a personal comment as done above. I have admired Masako ever since we lived in Japan the year she got married. She has a classic fashion sense and looks absolutely lovely in that burgundy. This is really not the place for mean comments...unfortunately there are plenty of those sites available elsewhere I am sure. Agree. I hope, that Prince Akishino do not appreciate this type of fans. Totally agree with you Monty. But the interior is not only minimalistic, it looks cold and strangely impersonal! I love minimalistic rooms and these rooms with old, polished wood in which everything is placed with harmony. But this room isn't an example for Japanese culture, not even for the modern Japan. She looks lovely, that red shade is very becoming to her.